make it perfect: .The new house - ENTRY/LOUNGE!. .The new house - ENTRY/LOUNGE!. And looking back down the hallway from the dining room. 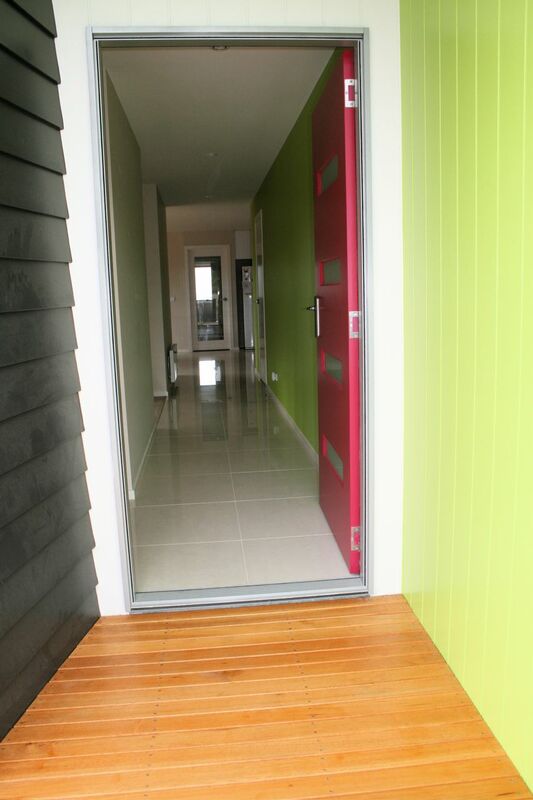 We contemplated painting the inside of the door pink too but thought it would make the end of the hallway too dark. 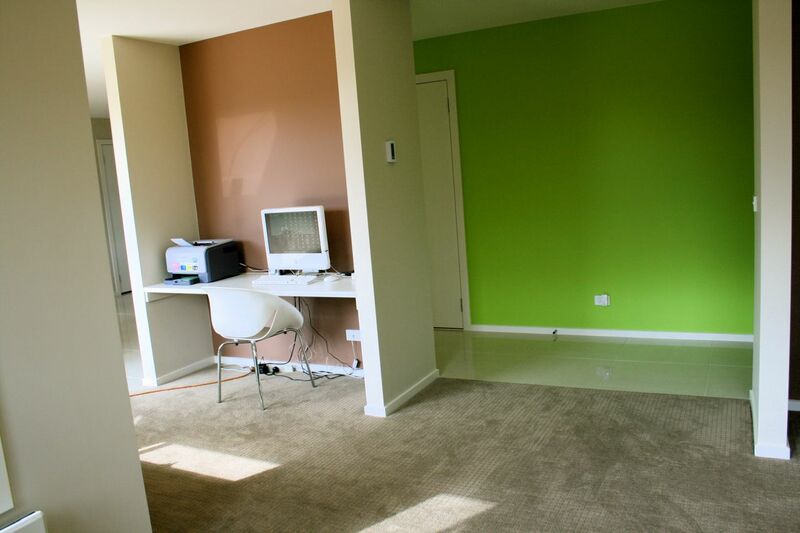 The door to the left goes into the garage/laundry and the break in the wall to the right to the lounge room. What to hang on the green wall? I've been thinking of a collection of fabric covered canvases all in different dark brown prints...any other thoughts? Just as you walk through the front door there is an alcove in the wall with a built in bench. This is going to be a "pretty" area :) I am on the look out for a BIG ornate frame that I can paint a solid colour and hang on the wall. Also going to find some nice baskets to sit on the floor to hold shoes. 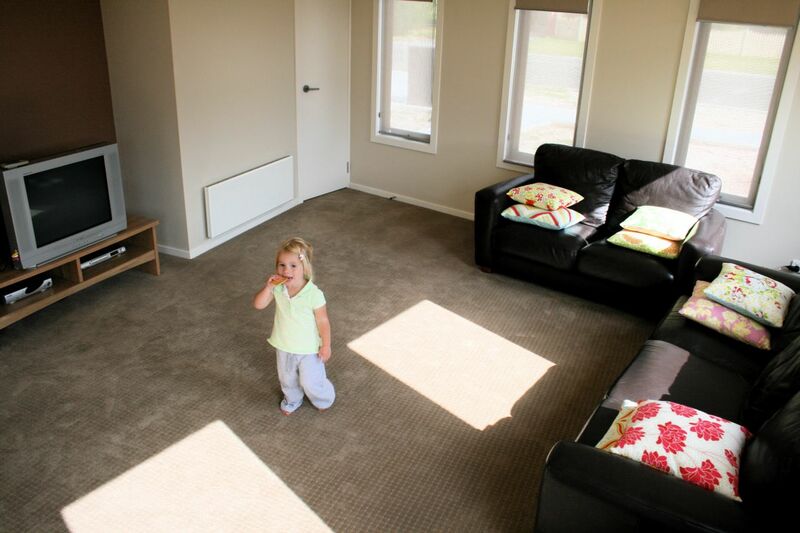 Into the lounge room...see what I mean about being able to keep an eye on the kids playing on the deck from here?! And this is our little computer nook. 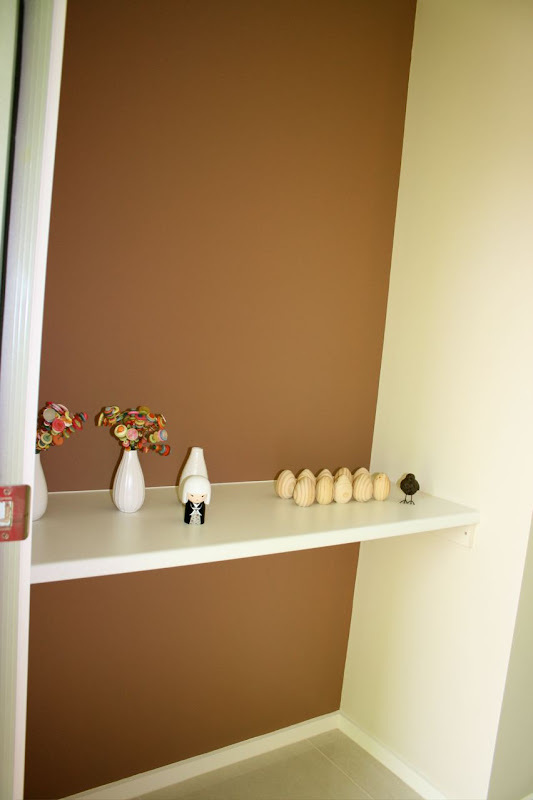 It sits in the wall between the loungeroom and the dining room. We installed a built in bench here too (same as in the front entry) so that we didn't have to worry about a computer desk. Currently on the lookout for a little filing cabinet or drawer system to pop underneath and hide the cords - this is Tommy's FAVOURITE place to play at the moment so we need to hurry up and find something that we like! Wow, those colours quite a unique combination! Love the little computer nook - such a great idea and doesn't waste any space. I'm excited to come for a look soon. Seth looked at these pictures and is demanding to go to Lil's house now instead of picking up the kids from school! Toni, you could put in a huge mirror in that little space with your button flowers on, then you can have a last minute check on yourself as you leave the house. I know that Pearts in Devonport have really big mirrors and they aren't expensive at all. P.S. I love how 'light' it all is. 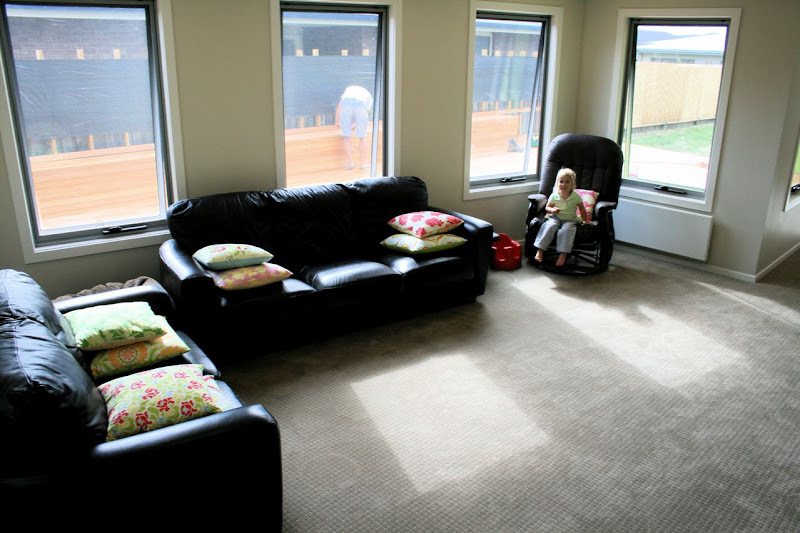 Love the lounge room with all the windows - Jaron did a great job on the deck! Also really love how the tv and computer are in Nooks and not jutting into the room - and just post a pic of the MESSY studio - !!! I love the little button flowers. Nice to meet you! Actually I do know of you and Jaron and Dave still has photos of you guys from YSA days! It's so nice to get in touch with you. I shall have to tell Dave! Love the computer nook. Love the entry nook. Love that carpet- I just want to lie down on it! It all looks great! Awwh i have been hanging out to see the studio. I love the way the cushions have been arranged in the lounge photo. My fav is still the green wall but i do love that alcove bit at the front door too. 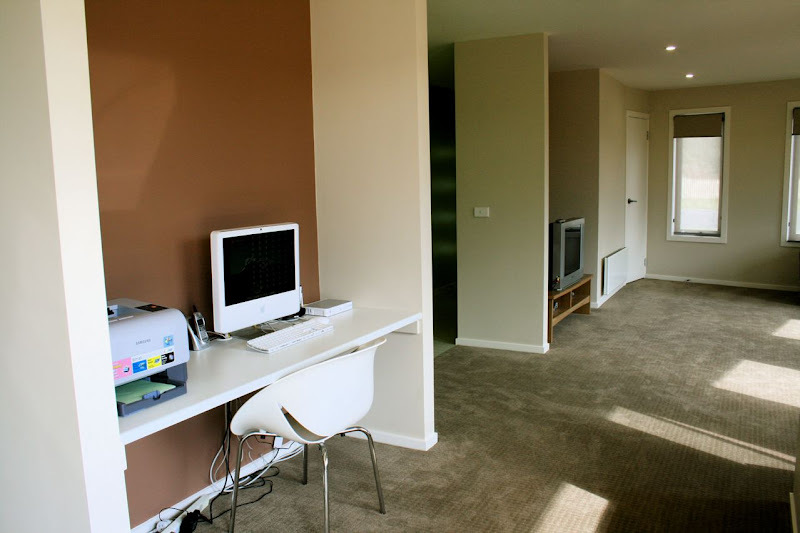 okay - so what is that door in the lounge room near the front windows? I didn't notice that today? Is it a cupboard? I think some sepia prints (or canvases) of your beautiful kids would look fantastic on the green wall (and bring in the brown from the nook to your left as you enter). If you use photos they are cheaper and can be easily updated as your children grow- use the came colour frame as the frame you will be putting just inside the entrance- Distressed white would look good, silver or even the door colour. I agree with Lorraine a large mirror in the entrance will reflect the light from outside too and brighten the area more (not that it really needs brightening!). You can get mirror cut to fit your frame (when you get it). I love all your colours!!! 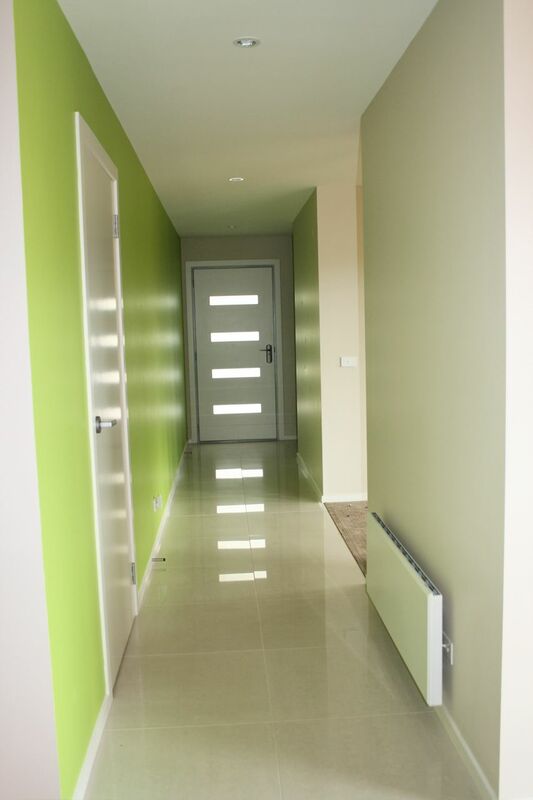 Is that color that you've used for the hallway apple green? Well, it kinda looks like it's apple green on the second picture. Anyway, I'm lovin' it! Oh, and your lounge looks oh-so-spacey! That's perfect for any types of door, but it would look best on a brightly colored door. That would certainly help add life and energy to any door. I wish that were available here! It would look great on my bathroom door.